This book is a visually beautiful compilation of daily devotions by and from missionaries from around the world. The truths shared aren’t for those in full time ministry only and can inspire anyone to live a life of sharing Jesus. Some of the devotions in this book created a great deal of gratitude. Gratefulness in being free to transport, openly read and publically share the Word of God. So many of us spend our days just trying to keep up and reaching others with the gospel is something we know we should do. Actually doing it tends to rarely make it on our To-Do list. This book does inspire you to do more of that when you read testimony after testimony of living out each day focusing on serving others. 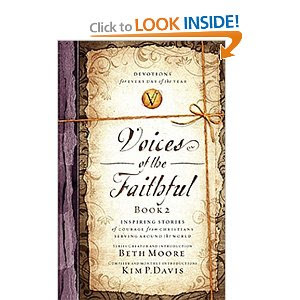 Voices of the Faithful Book 2 would make a nice gift but for me, it hasn’t become one of my dog eared, beloved treasures as others have. I had a hard time “connecting” with this book in a way and felt it was prettier than it was substantial. I’m not really sure why because it was okay … just not on my favorite and can’t wait to share list. I am still reading each day’s devotions and I do enjoy seeing things from perspectives of those in the front lines in missions. All in all, it is probably about what someone buying the book would expect to get. It is one I will probably tie a ribbon around and give out as a gift when I finish reading it.